Climate Common Sense: Huge Swing against Gillard in her Own Seat! 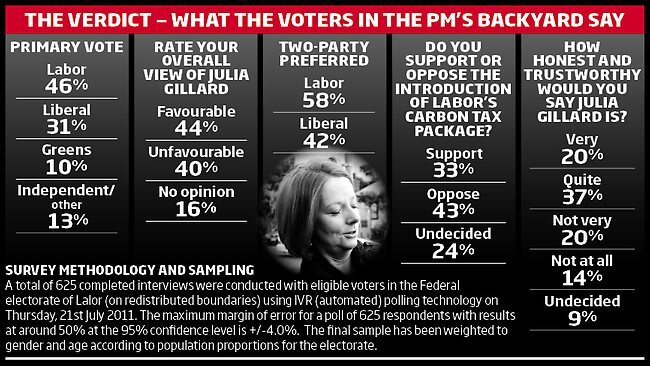 Julia's problems with the electorate are exemplified by the way voters in her own seat have turned against her. A massive 18% swing against her has been recorded which if repeated throughout Victoria would cause the loss of 14 seats. HUGE numbers of voters in Julia Gillard's heartland Labor seat have turned against her in the wake of her plan to tax carbon, according to a new poll conducted exclusively for the Sunday Herald Sun. Less than a year after 64 per cent of voters in the western suburbs electorate of Lalor gave the PM their primary vote, Labor would be forced to rely on preferences to hold her seat. Since August, Labor's primary vote in the seat has dropped by 18.3 per cent to 46 per cent, according to research by pollster JWS Research. Good onya Baron. I've been in electronics for a long time too, and I've got exactly the same perspective on all this as you. Maybe it's because we have to deal with *facts* in this business that we can see the stupidity of those zealots cooking up their Carbon Pollution Bogeyman.